I know a lot of readers are interested in a review comparing the Canon 60D vs. 50D. The EOS 60D was recently released, and has caused a lot of discussion as to how it fits into the Canon xxD lineup and progression. I wrote a bit about this comparison in a previous post comparing several of the dSLR cameras in the current Canon line-up (Canon 5D vs 7D vs 60D vs 600D/ T3i and 550D / T2i), but I will go into a bit more detail about how to choose specifically between the 60D and the 50D. As I always like to point out, when you are trying to determine which camera to purchase or upgrade to, you need to first consider and determine your needs, and then see which camera fills those needs. Not the other way around where you look at the new features and speculate if you really need or will use them. Canon EOS 60D vs. 50D: The Canon 60D sort of replaces the 50D, so I suppose people are trying to determine if they should get the latest camera (60D), or if they can save a little bit of money and go with the older model (50D), and then maybe use the leftover savings to invest in nice lenses. The 50D is no longer being manufactured, and new stock of them will only be around until they sell out. Don’t expect the price of the 50D to suddenly drop – typically, Canon doesn’t need to lower the price of the older model because they control their manufacturing and the timing of the replacement process very well. Unfortunately with digital cameras, they are all somewhat disposable. Yes, even $1000 cameras. Within 5 years or less, your new camera will have become “old,” outdated equipment. So the problem with the 2 year old 50D is that it is already approaching that point now. (Actually, in many ways it is 3.5 year old technology, since it shares most every feature of the 40D, including the autofocus system, but with a slightly higher megapixel count.) If you start with one now, in 4 more years its technology will be absolutely archaic! With digital SLRs, I advise buying a recent model, at whatever price range you can currently afford. Of course as with everything in digital photography, this is relative. The 50D is still an excellent camera. The 40D is still an excellent camera. And I just recently went out with a 5 year old 5D Mk I and was thoroughly wowed at how awesome it still is. But camera companies have to keep coming out with new models every 12-18 months because that is what they do. The trouble comes in 2-3 years when your 50D is still perfectly good and still pretty new to you, but it can no longer compete with the latest offerings in terms of megapixels, ISO performance, and autofocus systems. Maybe you will be fine with that and perhaps the 50D will still be serving your needs. But maybe you will have advanced as a photographer and start feeling left behind, wishing you had a more current model. You are going to have to consider that now. Since the Canon 60D basically replaces the Canon 50D (well, replacement isn’t exactly the right word because the 60D doesn’t really follow the 20D to 50D progression of improvements…), the 60D or 50D decision is an easy one. The 50D shouldn’t really be considered anymore. While the Canon 50D does hold a couple interesting advantages over the 60D (faster FPS in continuous mode, stronger construction, more comprehensive buttons and controls, complete lack of fun filters like “grainy black and white”), the sensor and exposure metering system have been greatly improved in all the newer cameras (7D or 60D or 500D/ T2i) and I feel these features, along with the increase in mega pixels, outweigh any other 50D advantages. I would definitely choose a 60D instead of a 50D. This is coming from experience, as I use a 50D professionally and on a daily basis. Or choose a 7D instead of a 50D if your needs require it and budget allows it. Sensor and Image Quality: The 50D has 15 megapixels and the 60D has 18 MP. At the time that the 50D came out, a lot of people were disappointed with the image quality and claimed that they crammed too many megapixels on the 50D sensor and that its image quality and sharpness suffered, especially compared to the 40D. This may be most noticeable in a head to head comparison of images, but I haven’t had an issue with this. You need to look at a site like dxomark.com to see actual lab comparisons. It looks like they are incredibly similar, with the 60D having slightly better high ISO performance. Both cameras are capable of taking professional quality images. Exposure Metering: This is where the big advantage of the 60D lies. The 50D has a 35-zone system and the 60D has the latest, more precise 63-zone exposure metering system. They both have 4 metering modes: evaluative, partial, spot, and center weighted. I have found that the 50D overexposes by about 1/3 stop with evaluative metering, so I always had the exposure compensation on -1/3. However, I switched to center weighted metering, and the exposures have generally been fine. From extensive experience with the 7D, which shares the same metering system as the 60D, I feel the new 63-zone system is noticeably superior and determines proper exposure 99% of the time, even in difficult and dramatic lighting situations like back-lit scenes. The 50D does not perform quite that well, and requires occasional use of exposure compensation and switching of metering modes for better exposures. Autofocus: The 50D and the 60D share the same autofocus system, with 9 focus points and three auto focusing modes. The 9 AF points of the are all accurate cross-type. This autofocus system is much less complex than the sophisticated AF system of the 7D with its 19 AF point system and its additional Zone, Spot, and Expansion focus modes (not the same as spot metering mode) – plus the custom settings of the 7D which will allow one to customize how the AF system works. If you are an avid action, sports, or wildlife shooter, or someone who understands, needs, and will use the elaborate features of the 7D AF system, you should consider the 7D. The next, future camera in the 60D price range will inevitably incorporate a better autofocus system, as this 9 point AF system has become dated. Construction: The 60D is slightly smaller and lighter than the 50D, in part because its construction is aluminum and polycarbonate rather than the magnesium alloy of the 50D. They both have some amount of weather sealing, for example in the battery and memory card doors. For most users, including even those using the camera daily or in travel situations, the construction of either of these cameras is far more than good enough, strong enough, and durable enough. ISO: The 60D looks to have slightly better performance with high ISO settings. Again, have a look at dxomark.com to see actual lab comparisons. Controls: As with construction, the buttons and controls vary slightly with these cameras. The 50D has the thumb joystick, called the Multi-controller, used to select focus points and other things. With the 60D this control has been moved to the center of the Quick Control Dial on the back. Since I am so used to the joystick of the 50D and the 7D, I find the new 60D control a bit more cumbersome, and raised slightly too high in relation to the surrounding dial. However, it is easier to select the diagonals (corner AF points) with the 60D controller than with the 50D controller, and I have missed many shots with the 50D due to this difficulty. It may be just fine once one gets accustomed to it. The 60D also assigns only one setting to each of the top buttons and I wish they had retained the 2 settings of the 50D. However, the Q Button and Menu of the 60D make it easy to choose any setting. The 60D also has the locking Mode Dial, which prevents it from moving inadvertently. I think this is a great addition. However, it requires 2 handed operation or careful one hand coordination to change it, which has frustrated some. Menus and Custom Functions: These allow for greater control over customizing how the camera functions. These settings on the 50D and 60D are almost the same except that the 60D also has the additional Movie Mode menu settings. Plus the 60D has the in-camera filters (grainy b+w, toy camera, etc) and processing features (RAW to JPEG, resizing, etc). However, these are all a bit gimmicky and these types of operations can be more easily done in Photoshop and in batches rather than one image at a time in the camera. Since many of the Menu and Custom Function settings can be complicated and confusing, especially to a new dSLR user, my eBook on the 60D, Your World 60D covers all of these options along with my recommended settings to get you up and running quickly! Wireless Flash: Like the 7D, the 60D incorporates wireless flash triggering, which the 50D does not have. It allows you to trigger multiple off camera flashes at different output levels. Articulating LCD Screen: The big new feature of the 60D that no other current Canon dSLR has is the articulating rear LCD screen. This may prove useful for videographers, as well as for setting up compositions while the camera is on a tripod, for macro use, or for using it from unusually low or high vantage points. Some users will be able to avoid buying an expensive angle finder because of this feature. There is also an electronic level in the 60D, visible in the viewfinder, rear LCD, or top LCD. Viewfinder: The 60D has a large, bright viewfinder with 96% coverage of the actual resulting image, a tiny bit better than the 95% of the 50D. Processor: The 60D shares the same Digic 4 processor as the 50D. Continuous Shooting Speed: The 50D can shoot 6.3 consecutive frames per second (fps) and the 60D shoots a slightly slower 5.3 fps in high speed continuous mode. They both also offer 3 fps continuous shooting mode. Again, if you often capture action and really need the higher frame rate, you are going to have to consider the 50D or the 7D, with its blazing 8 fps, which is actually overkill in typical real-life use. Memory Card: The 60D uses the SD memory card like the 550D/T2i, not the CF card of the 7D and 50D. Battery: The 60D uses the LP-E6 battery like the 7D and 5D, which is a nice feature as this battery can often last through a full day of shooting or longer. The 50D uses a slightly smaller battery with less capacity. There is also a battery grip available for the 60D, the BG-E9 which holds your choice of either 2 LP-E6 batteries or 6 AA batteries, to lengthen your shooting time and give you an easier to handle camera if you often switch between shooting horizontal and vertical shots.. Size and Weight: The 50D is slightly larger and heavier than the 60D. Both are a comfortable size and weight, but you should check them out in person to see which feels better for you. AF Microadjustment: The 50D has this feature, the 60D does not. Many are disappointed that the 60D does not include the ability to micro-adjust the focus so that each lens is completely accurate. However, if you have a focus issue, send your camera and/ or lenses to Canon while under warranty and ask them to calibrate them. Full HD video: Of course the 60D offers this capability, while the 50D does not. Flash Sync: A Note to Strobists -the 60D does not have a PC sync flash socket to plug in PC sync cords. The 50D has this. In conclusion, I would like to mention again that I have written an eBook user’s guide for the Canon EOS 60D (and one for the Canon Rebel T2i and Rebel T3i). After spending so much time studying, experimenting, writing about, comparing, and discussing these cameras, I decided to put some that knowledge into eBook form! Each of these user’s guides cover all the Menu settings, Movie Mode menus, and Custom Function settings – with recommended settings – plus discussions of how, when, and why to use the cameras’ settings and features, (metering modes, aperture and shutter priority modes, advanced autofocus use, and more) for everyday and travel use, to help you take better photos – Your World 60D, T2i Experience, and Canon T3i Experience. Learn more about the eBooks by clicking on their titles. As a Winter special, both books are on sale! Purchasing the 60D: If you plan to buy the Canon 60D or any of these cameras through Amazon.com, I would appreciate it if you use this referral link to Amazon or the camera links just below. Your price will be the same, and they will give me a little something for referring you, which will help support my blog. Thanks! If you are purchasing from Amazon UK or wish to purchase from B+H Photo, please see just below for that info. 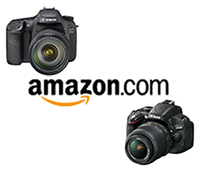 See the 50D on Amazon. See the 60D on Amazon. See the 7D on Amazon. If you are in the UK, you can click here for the UK Amazon referral link. If you are in another country, click on one of my Amazon links, scroll to the bottom of the page, and click on your country for your local Amazon. For those interested in purchasing from B&H Photo, Adorama, or direct from Canon, please click on their logos on the Gear page. Thanks! Accessories and Books: Now that you are on your way to deciding on a camera, you should also start looking into photography gear, accessories, and books. Check out this link, Equipment for Travel Photography, which discusses useful and practical photo accessories and equipment for both everyday and travel photography. This post lists and describes Essential Books for Digital Photography, including the best user’s guides for each of these cameras. DPReview has an excellent, very thorough review of the 60D. They concluded that “for the Rebel upgrader it’s a better option than a second-hand 40D or 50D in almost every respect.” They indicate that for the 30D, 40D or 50D “upgrader,” the Canon 7D is the way to go. As I said above, when you are trying to determine which camera to purchase or upgrade to, you need to first consider and determine your needs, and then see which camera fills those needs. Not the other way around. Here is a post I wrote which discusses this, titled How to Choose a New dSLR Camera. Which Canon dSLR is Right for You? How do the two cameras compare in the HDR arena? The 50D can take 3 pictures at a time – can the 60D take more? Does it matter? I am obviously new to this and would appreciate some information on which is best to get into HDR. The 60D, with Auto Exposure Bracketing, can take 3 successive shots up to +/- three stops, just like the 50D. I know that many HDR shooters wish Canon had made this 5 or more shots with +/- five or more stops. However, serious HDR shooters typically work off a tripod, determine their primary exposure, set the camera on Manual mode, and manually change the + and – exposures by changing the shutter speed, instead of using another shooting mode in conjunction with Exposure Compensation. This is for more control of the results – because when using exposure compensation to vary your exposures, the camera may change your ISO or may change your aperture setting in order to get the + or – exposures, and you don’t really want the ISO changing and definitely don’t want the aperture changing during an HDR shooting sequence. Thank-you. I bought the 60D. I’m glad I was helpful in making your decision! Don’t forget to check out my ebook “Your World 60D” to help you get up and running with the 60D, help you set up all of its menus and custom functions, and start to really take control of your camera! Wish I got the 60d, but it’s past the 90 day period at Costco for the 50d I ended up with. Thanks for your info. I am a full time Pro and use my 50D every day. I also have a couple of 7D’s. For most shooting I find the 50D easier and quicker to handle so given the choice I grab it. I will actually grab my 40D before the 7D when the result will be the same. As you know, on a Pro level all the equipment are just tools. Different tools for different Jobs. Here are 2 killer problems with the 60D for your readers to consider. For me these 2 issues are deal breakers. 1) Memory Card: The 60D uses the SD memory card like the 550D/T2i, not the CF card of the 7D and 50D. SD cards are real slow compared to the larger CF cards. Many CF cards are still too slow for HD Vid, but SD memory would make that a painful job. I had to upgrade my CF cards when doing vid with the 7D. 2) Flash Sync: A Note to Strobists -as mentioned above, the 60D does not have a PC sync flash socket to plug in PC sync cords. The 50D has this. OMG… I can’t even think about not having a flash sync. There are so many times that this archaic tool is so useful that to do with out only means using the hot-shoe to perform the same function. With the 50D and every pro camera I have had for the past 25 years I have been able to use the hot-shoe and the flash sync independently or as backup for the other, as both have a high fail rate compared to the rest of the camera. So Staying with the 50D is my choice. I do have a question though. Looking over my older images I noted that uncorrected the skin-tones seem nicest when I was shooting with the 20D. Additional rez. and such seem to be at a different type of image quality cost. The skin-tones of film were amazing, but we gave them up for the advantages of shooting Digital. Am I mistaken in seeing a loss in the quality of skin-tones with the 40D and later cameras? I would like to add another thing to think about. What version is the camera raw? The RAW files from the 50D can be read by Photoshop CS3, but RAW files from the 7D can not. I will have to upgrade or use the canon software to convert these. I have decided not to spend the money on upgrading Photoshop from CS3. It does what I need and so choose to stay with it. Actually sometimes I have to go back to PS7 for some things that got “upgraded out” of CS and above. So I don’t think “upgrade” always means better. So the question here is; are the RAW files of the 60D readable by CS3 like the files from the 50D? If not that adds around $200 to my cost of upgrade. Thank you so much for the link to the DXOMark comparison! It shows much of what I have notesed over the years using the whole line of Canon cameras. What a great tool. Thank you. I have the 50D and I still use my XT; both give me great pictures with great color, so the way I look at it is, why bother with the yearly hype? The point is the picture, not the machine you used to take it with. The point is to see. Thanks! Because of this website I will go w/the newer 60d instead of a refurbished 50d. I have one of the 1st rebels that came out and am long overdue for a new dslr. I would have liked to purchase the 7d but finances dictate otherwise. I narrowed it down to the 50d or the 60d. Conflicting reports made the decision difficult and your comparison helped to clarify what I need. I need to stay w/Canon since I already own lenses but I think since I keep my slr’s for such a long time an newer model would be preferable for my uses. Thank you!!! Wonderful! Glad I could help. You will be very happy with the 60D. I appreciate your taking the time to post comments on a forum. I didn’t expect a pro photographer like you to spend time doing that. I found your eBook useful for my 60D. I plan to get into flash photography soon, because I don’t have room for a lens in my budget. I am planning to get a LumoPro LP160 because of its capabilities and low cost.